1997 "The Holy Grail of ACQUIRE"
The following excerpts are from conversations with Roland Siegers, the creator of Acquire '97. These conversations transpired through email between August 31st and September 4th, 2012. "For the toy fair in Nürnberg in 1997 just a few prototypes were made. The rules just exist as photocopy. Only the cards were produced, but the cards disappeared in the last days of surviving from Schmidt. Concerning the prototypes: I think 10, maybe 12, were made. I really don't know what happened to them. I suppose that the rare prototypes were destroyed. The only "complete" prototypes were "owned" by Knut Michael Wolf, maybe Bärbel Schmitz and me, as far as I know. Concerning the rules: I will send you today the rules, in German of course. At first I have to scan every page." The box looks the same as the 1993 Schmidt Spiel edition except for a red label in the top left corner that reads, "New Edition." The layout of the board created four quadrants on the board that all had the same tile designations. 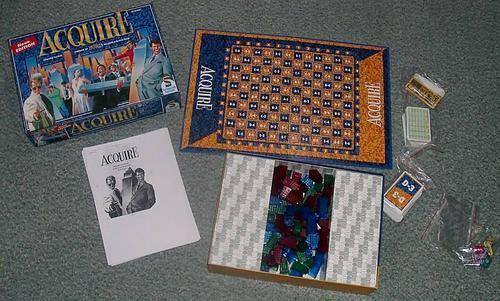 The game did not include the plastic grid to hold the buildings in place which was used in the 1993 edition. Without the plastic grid the buildings would have been susceptible to movement during game play. 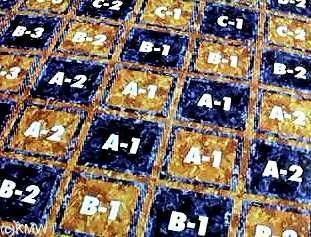 Playing cards were used for tile designation, but there were four cards with the same square designation. The player had to decide in which quadrant they wanted to place their building. The board has 120 squares (10 rows of 12 squares). Each quadrant has 30 squares. This essentially increases the odds of mergers to 1 in 30 instead of 1 in 108 as in the normal game of ACQUIRE. With mergers becoming more frequent, cash flow is increased during the game. The quadrants also help to keep all players involved in the game by decreasing their odds of having a hand of cards that are all away from the action of the game. The future of ACQUIRE was almost hatched in this plan by Roland Siegers to create ACQUIRE '97 or "Quadrant ACQUIRE" and would have been well received by a fan base that is yearning for more from the game. Due to Mr. Siegers fantastic ingenuity, ACQUIRE fans can always hope for the "Holy Grail of ACQUIRE." It would be impossible to imagine what a copy of this edition would bring on the open market.